If you are ever to serve someone with steak, do yourself and do them a favor by accompanying it with a good set of steak knives. Ones that actually cut. Or it could be highly embarrassing. For both sides. You see, a steak is a big piece of meat, and you need to cut it small. And you have to be determined once you’re already at it, because it would be rude to just give up and push what you’re served aside! Every time I’m equipped with a dull knife, I always try to apply more force. That either results in me sending the steak, together with some tablewares, off the plate onto the floor. Or if I manage to cut it, it’s such a struggle I can’t really enjoy the meat anymore. If you spend so much time and effort on making a tasty, juicy steak, it only makes sense to get some nice, quality steak knives so you or whoever you serve the steak can truly enjoy it. How to choose the best steak knives: serrated or smooth edge? Straight-edged steak knives glide through the meat effortlessly (that is, if they’re sharp), leaving a clean, smooth surface. Straight edged knives get dull much faster on a ceramic plate, and need sharpening much more often than serrated knives. However, they are also much easier to sharpen or hone —> you can keep them for decades. Serrated knives, meanwhile, saw through the meat, resulting in a slightly more jagged and shredded cut. They can work for much longer than non-serrated ones without the need for sharpening. That said, with lots of small “teeth”, they are more difficult to sharpen and to clean, especially the micro-serrated ones. Personally, I prefer serrated knives. I like that I don’t have to hone them with a sharpening steel before every single meal. Besides, modern sharpening tools have also made it easier (compared to before) to sharpen them whenever needed. Also, I don’t mind that the meat has a slightly more jagged surface – I actually think it smells better and looks more juicy that way! Then again, to each their own. J.A. Henckels offer a wide selection of steak knives (as is the case with other Henckels kitchen knives,) with prices ranging from a few dozen bucks to half a grand (as in the case of their Miyabi Artisan line). Taken into consideration ease of use, price, and aestheticity, below are my our picks of Zwilling and JA Henckels steak knife sets for your consideration. High quality, exquisite looking, and bearing the Zwilling J.A. Henckels name on it, this 8-piece steak knife set will make a great gift for your family or friends. The knife set comes in a lovely rosewood box with a deep-auburn, mahogany finish, and the well recognized Zwilling logo on it. Held closed with a brass clasp, it almost feels like a jewelry box, except slimmer. Inside the box are 8 sleek metal steak knives, each proudly printed with the brand name and logo along the blade. They’re all Spain made with a special formula of stainless steel that makes them not only extremely durable but also very pleasantly shiny. 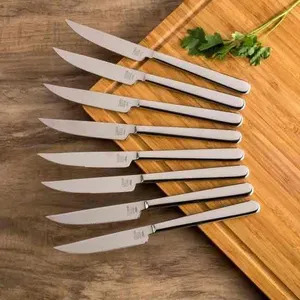 Each of the knives comes in a one-piece construction, with the thin, elegant handle connecting with the blade seamlessly. This enhances the sturdiness of the item significantly. It also means that these knives are easy to clean. In fact, while hand-washing is always recommended, they’re perfectly safe in a dishwasher. With serrations on their edges, these knives are extremely sharp. The streamlined design allows them to slice through the toughest meat effortlessly, leaving very little visible fiber tear on the surface. If you are upgrading to these from casual knives, you will realize all the struggle you went through trying to eat your steak is totally unnecessary! Classy and modern in style, this set can easily make a perfect addition to any stainless steel set of silverware/flatware. If you’re having guests over for a meal, be prepared to get compliments on the knives! If you want a decent set of steak knives from J.A. Henckels but don’t want to spend too much, definitely give this set a try. The steak knives come in a pretty unappealing plastic packaging. If you have very uncritical eyes, you may think it doesn’t look like a gift box. Personally I find it so cheap looking it’s almost an insult to the Henckels name. However, once you’ve seen and touched the knives, you will find that they’re actually an incredibly good bang for the buck. They’re of very decent quality and aestheticity! This set comes with 8 pieces, each a one-piece stainless steel construction with a full tang, making it very nicely weighted and sturdy. The tang is slim, sleek, and elegant (if you have larger hands you may find it a little too small). It can match well with, and even add classiness to your silverware or stainless steel flatware. The blade, meanwhile, is thin, and is fully serrated. It’s incredibly sharp – as you may expect a Henckels to be – and stay so for years without sharpening or honing. With a remarkable distance between its teeth, however, this blade tend to tear a bit while it cuts. As I said, I like it that way, but if you prefer very fine, smooth cuts you may find this set unideal. This set is dishwasher safe, and many users have confirmed that the knives come out of the DW like new. However, as usual, I’d recommend hand-washing them. With a one-piece construction, they’re super fast and easy to clean anyway. These German made steak knives are the ones you can pass on to your grandkids. And they’ll actually feel thankful. First, these steak knives are made with Henkels’ well-known Sigmaforge technology. Each knife is constructed out of a single piece of special formula stainless steel, with a strong blade and a full tang running all the way through the handle. The knives then undergo a process called Friodur ice-hardening, which enhance blade durability and minimize discolorations. They can hold up to decades of use with proper care! Typical of forged knives, each of them comes with a bolster in the center, giving it extra weight and balance. With a triple riveted ergonomic tang, these are a bliss to hold in your hand. I personally prefer serrated blades, but if you have a soft spot for perfectly fine, smooth cuts, you will fall in love with these. All of the edges are laser controlled, and are hand sharpened and polished by Zwilling’s professional artisans. Not surprisingly, they are super sharp, even for a Henckels. They literally cut through the toughest steaks like a hot blade through butter. Unlike serrated blades, however, these straight edge knives need frequent honing and occasional sharpening in order to keep their sharpness. Run them through a steel or a sharpener after several uses, and they will be happy to serve you through your lifetime. These knives are dishwasher safe, but they will hold up for longer if washed by hands. With no teeth, they’re very easy to clean anyway, so it’s not worth the risks to put them into a dishwasher. Tired of standing at the sink to hand wash your knives after every use? Go for this steak knife set from Zwilling J.A. Henckels. The set includes 4 slim, shiny inox knives. Since each is a seamless piece of exclusive-formula stainless steel, they’re extremely easy to clean. In fact, these are among the very rare knives that you can leave inside a dishwasher after use. They will come out like new – no dulling, rusting, or damages! The blades are thin and are 4 inches long, with the Zwilling J.A. Henckels name, logo, material printed along each one. These are made in Spain, as written on the blades. The knives are all fully serrated, which means they can cut through the toughest of steaks with ease. They’re very very sharp to start with, which is expected of all Henckels, and they can keep their edges after years of frequent use. With the surginal sharpness, they give quite a clean and smooth cut through the meat. If you’ve been using casual steak knives, this set will be a total upgrade! They cut so effortlessly and with barely noticeable shredding – not one of those knives that make you embarrassedly saw the meat and make a mess on your plate. With a solid stainless steel handle, these knives feel well-weighted and balanced in the hand. Since each is a single seamless piece of inox, they will not only complement your existing silverware or flatware, but will also add elegance onto your dining table on their own. In fact, I think they look even more beautiful than the pricier knives by Henckels or other brands! Not the fanciest among J.A. Henckels steak knife sets, but this set is very well loved for its functionality and affordability. Each of the knives comes with an ergonomic black synthetic triple-riveted handle. The tang runs through the whole handle, giving extra balance and stability to the whole item. As stamped knives, these have reasonably thin blades. Along the blade is the printed logo and brand name, which, if the diner knows a little about knives, will add extra exiquility to the meal. Unlike lesser steak knives that feel thick and bulky in the hand, these J.A. Henckels are slim and feel easy to grip. All of the knives in this set are micro-serrated, which means they have a lot of tiny teeth along their edges. These help to cut through the meat easily and leave a smoother cut than normal serrated knives. The teeth are also what keep these knives sharp for years without sharpening. Cleaning these knives are easy, but you may need to wash the edge a little more carefully, as little particles of food or dirt could get in between the teeth. They’re dishwasher safe, according to the manufacturer, but I’d recommend washing them by hands. The strong soap and the movements in the dishwasher can leave pretty bad damages on these knives. Unfortunately, the micro serration means you won’t be able to sharpen the knives once they’ve got dull. That will take years, but if you’re planning to pass your steak knives on to your grandchildren, these are not the ones to pick. Luna is an advocate for balanced eating and healthy living, which she believes are the foundation of true wellness. Healthy Kitchen 101 is where she shares her wholesome recipes, cooking tips, and kitchen tool reviews to make a healthy lifestyle an easier, more convenient choice for busy individuals and families.